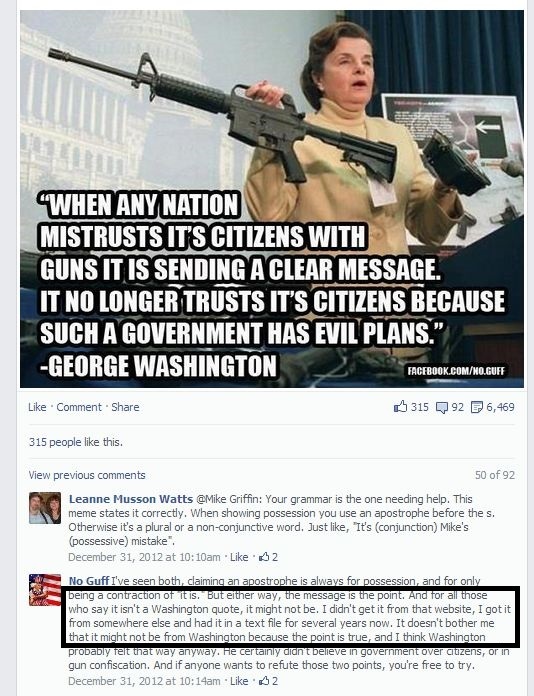 Was George Washington the source of this quote equating government gun control with evil intentions? When any nation mistrusts its citizens with guns it is sending a clear message. 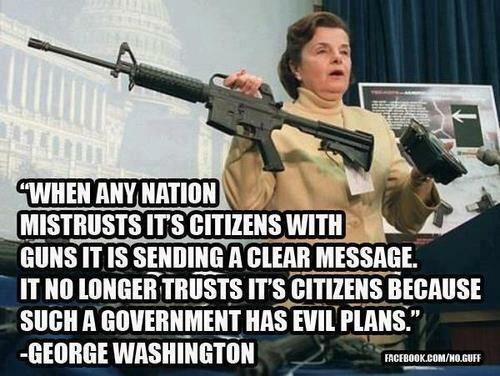 It no longer trusts its citizens because such a government has evil plans. Did George Washington really say this? I can find plenty of people citing him with this quotation, but nothing that looks like a legitimate source (mostly personal blogs and opinion pieces). It doesn't really sound like the phrasing I would expect him to use. The evidence clearly suggests current-day pamphleteer Joe Spenner is the author of this quotation, not George Washington. The author of the quote appears to be someone named Joe Spenner who authored a pamphlet in which there is an introduction by Spenner (note the absence of quote marks - he isn't quoting) containing the phrase in question, below this a horizontal dividing line, below the line are a series of quotations (in quote marks) attributed to George Washington. It seems clear that the quotation in question is part of Spenner's introductory remarks and Spenner is the original author. I added the rectangle to highlight the author's view of the reliability of the attribution. Other than my added rectangle, this is a straight clip from the facebook page from which the image in the question originated. The preservation of his papers was a subject never far from the mind of George Washington. In fact, his deathbed instructions to his secretary Tobias Lear in December 1799, to "arrange and record all my late military letters and papers . . . and other letters," were only the continuation of a practice that Washington had begun as a young man when he began saving his incoming letters as well as copies of most of his outgoing correspondence. A half-century of farm management, land speculation, business enterprise, and public service eventually came to be represented in the mass of written material that comprise his public and private papers, some 135,000 surviving documents. So if he did say it (or write it), it wasn't in what were regarded as his most important writings. The first occurrence of "evil plans" in Google's collection of 40 million books is in 1810 - long after Washington was laid to rest. The attribution to Washington is most likely an error. Not the answer you're looking for? Browse other questions tagged quotes guns george-washington . Do [US] states with the most gun laws tend to have the fewest gun deaths? Gun control: are domestic disputes a major cause of gun deaths in the US? Did George Washington say it was impossible to govern without the Bible? Did “The Boy in Striped Pyjamas” have this quote, which has been compared to Trump's slogan? Did The Maharal of Prague claim this verse was recursive?